From this …. The Robsonstrasse Hotel and Suites. To this … an artist’s rendering of the future look of 1394 Robson. The meeting will take place at Vancouver City Hall (453 West 12th) and everyone is welcome to attend and speak to the issue. Hong Kong-based Asia Standard Americas (ASA), which is also responsible for the Empire Landmark Hotel redevelopment, has submitted an application to develop a five-story commercial (retail and office) building with restaurant and retail uses on the ground and third level, all over one level of underground parking to be accessed via a car elevator. Cascading outdoor terraces are proposed for each upper floor of the building’s Robson Street frontage, which also has a sidewalk setback to enhance the street’s public realm for pedestrians. This design maximizes the allowable density permitted by the site’s existing zoning. The City of Vancouver is conducting a series of participatory budgeting meetings in the West End, a process used in cities around the world to involve citizens in government spending decisions that impact them and their neighbourhoods. This series of conversations is designed to help the city plan the use of additional revenues collected through the West End permit parking fees. This year $100,000 in funding has been dedicated to West End projects and initiatives. Community assemblies will take place on Saturday, February 2 at the West End Community Centre from 2 to 4 p.m. and Thursday, February 7, from 6 to 8 p.m. at the Dr. Peter Centre. If you are unable to attend those events you can find the online survey here. Ideas will be collected until February 21. In an adventure they are calling “The Pilgrimage” the congregation at St. Andrew’s-Wesley United Church are vacating the historic premises for the next 18 months or so and relocating their events and activities to other West End locations. Eighteen months ago it was determined that the heritage building, built from 1927 to 1933, was in need of repairs and a seismic upgrade. While a team of contractors and artisans work on restoring this beautiful building, the congregation had to find new venues for their many services, concerts, and recitals. After much searching and many conversations, here is where you will find their four main events starting Monday, February 4. The Sunday 10:30 a.m. worship service will take place right next door to the church at the Century Plaza Hotel (1015 Burrard) in the second-floor ballroom. The Sunday 4:00 p.m. Jazz Vespers at the adjacent First Baptist Church (969 Burrard). The Sunday 7:15 p.m. Candlelight and Music will be 10-minute walk away at St. Paul’s Anglican Church (1130 Jarvis). All other programs, education, lectures, and groups will also take place in the Salons. The church parking site continues to be operational, so you can still park there! For the Candlelight and Music service, there is also paid parking next to St Paul’s Anglican. 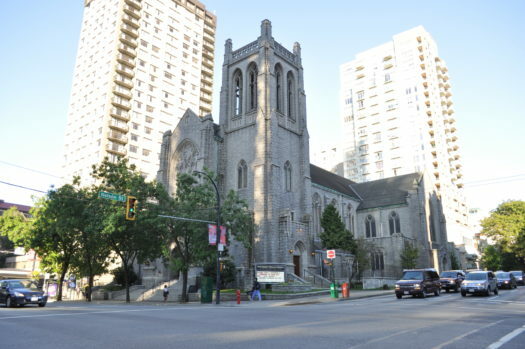 Located at the corner of Burrard and Nelson Streets St. Andrew’s-Wesley United Church is a designated heritage building, and features a mock 14th-century-style Gothic tower, a high vaulted nave, deep transepts, and abundant light. Both the traditional leaded glass and the more recent dalle de verre glass art technique are represented in its magnificent stained glass windows. The building was constructed from Nelson Island granite and Haddington Island stone and now work begins to repair and restore the beautiful building as it gracefully ages. An ad-hoc group of West Enders, representing several local organizations, held a roundtable discussion with eight Vancouver City Councillors on January 17 to press their concerns that the City is not adhering to some important terms of the 2013 West End Community Plan (WECP). Meeting with all but two invited Councillors were members of WE Act Now, West End Families In Action, Denman and West Neighbours (DAWN), West End Arts (WE Arts) and the West End Seniors’ Network (WESN). Not in attendance were Councillors Melissa De Genova and Lisa Dominato. Three main areas of concern were: the developments at 1150 and 2030 Barclay Street, which have had approval for square footage (FSR) and height outside of the original guidelines in the WECP; transportation concerns, specifically around the trend to approve more parking spots in new developments than required, and the attendant added congestion to West End streets; and the need for a comprehensive and public review and update of the West End Community Plan in light of the apparent erosion of its authority as a guiding document for development and evolving community needs as a result of such infrastructure changes as the planned move of St. Paul’s Hospital. The community representatives at the meeting were candid in expressing a felt sense of cynicism in the neighbourhood about the City’s commitment to the West End Plan as it now stands. One attendee at the roundtable reported that the Councillors were open and engaged and the group looks forward to continuing dialogue. The West End Journal will report back on future developments as WE Act Now continues this initiative. Milan Streit is The West End Journal’s new contributor from King George Secondary. Welcome to the team Milan! 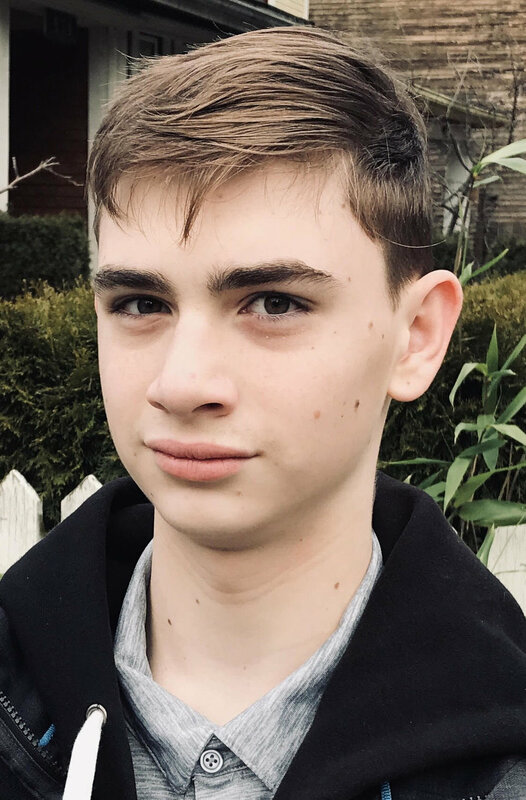 Introducing The West End Journal’s new contributor, King George Secondary School Grade 9 student Milan Streit, who will keep us up-to-date on what’s afoot in this busy centre of youth activity in our community. This column is titled in honour of the school’s celebrated basketball team, The King George Dragons. King George Secondary is set to hold a free public event organized by many of our hard-working students. The Middle Years Personal Project Fair on Wednesday, February 13 (from 1 to 3 p.m. and 7 to 9 p.m.) is an opportunity for teens at the school to display their yearly personal project. Grade Ten is the last year of the International Baccalaureate Program, MYP system, which starts in Grade Six. Last year at the Fair, one student did a summary about his experience in the growing E-Sport community. He included a Nintendo GameCube (the game system it runs on) showing off his skills in Super Smash Bros Melee (2001). Another student's passion project was building designs. He built an incredible 3D mini replica of the famous Library Square in downtown Vancouver. A third student created a working electric guitar and played an epic song on it for fairgoers. This year there will be many hands-on projects with which you can interact. Like a science fair, there are many cool, innovative inventions and displays which Grade Ten King George students have been passionately working on throughout the year. Also open on this special night will be the King George Archives. Years of school historical objects have been lovingly collected and put on display. Included are yearbooks, photos, and building models dating back to the 1920s. In the March issue of The West End Journal, we will meet some of the great minds at the 2019 MYP Fair and share some photos. ANOTHER GALA GALA DO ! We must not forget that some of Vancouver’s busiest hotels, The Sutton Place, The Wedgewood, and the Century Plaza, are all located on the west side of Burrard, and therefore are in the West End. And we’ll never forget Joy Metcalfe, who for decades covered every “gala gala do” in town with “Joy’s Journal” in The Vancouver Courier, The Province, and daily on CKNW. We’ve persuaded Joy to share this report of a recent gala gala birthday do at The Sutton Place. And of course, the names are in bold! Wasn’t that a party! The 160th Birthday Boy’s Birthday Bash was hosted by those irrepressible twins, Jeffrey and Peter Barnett at the Sutton Place Hotel last Sunday morning. The celebratory bruncheon was marking the twin’s 80th birthday, with family and guests attending from far and wide including, such hospitality veterans as emcee Paul Tilbury, talented and witty P.R. Duncan Holmes, CanadaWide’s Peter Legge, furniture doyenne Margaret Segal (remember My Daughter, The President) and Variety Club’s Howard Blank and Peter Chipman. The Barnett’s business acumen was legendary with The Watermark, Rosie’s on Robson, The Rainforest Cafe in Metrotown which astonished dining guests with rain showers, exotic animals and fun menu, the popular Elephant and Castle and Pizza Patio, one of the first pizza places to open in Vancouver. The east-west lanes throughout our neighbourhood have been officially named in honour of notable Vancouver citizens, recognizing their achievements and contributions to our community. Jepson-Young Lane runs between Comox and Pendrell, from Thurlow to Cardero and is named after Dr. Peter Jepson-Young (1957 - 1992). Better known as Dr. Peter, Jepson-Young was a Vancouver doctor who promoted AIDS and HIV awareness and education in the early 1990s. First diagnosed with AIDS in 1986, by 1989 Jepson-Young was unable to continue his medical practice due to his failing health. Turning his attention to AIDS education, in 1990 Jepson-Young began the Dr. Peter Diaries with five episodes airing on the CBC Early Evening News . Through these short segments, in which he was only referred to as “Dr. Peter”, he shared his experiences with the general public. Dr. Peter continued the series through 111 episodes from September 1990 up to his death in November 1992. At the time of his death Jepson-Young had survived with an AIDS diagnosis longer than any person in British Columbia. In 1993, The Broadcast Tapes of Dr. Peter was nominated for an Academy Award for Best Documentary Feature. Shortly before his death, Jepson-Young established the Dr. Peter AIDS Foundation. 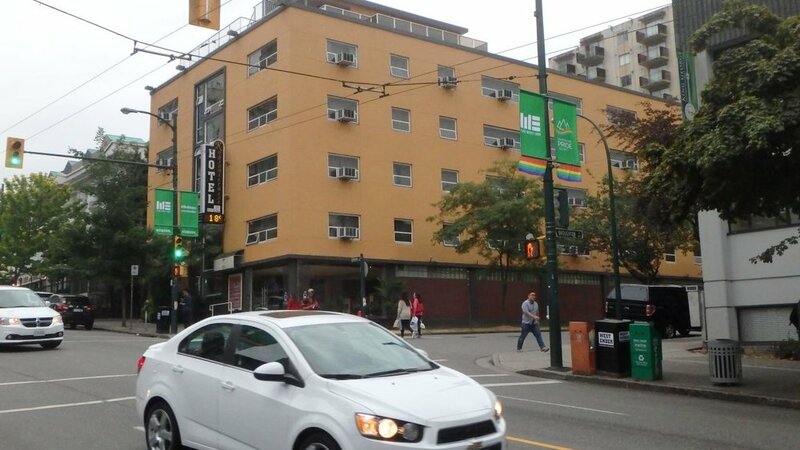 The foundation established the Dr. Peter Centre, consisting of a 24-hour specialized nursing care residence and day health program dedicated to helping those with HIV/AIDS, located at the corner of Thurlow and Comox. Adopted in 2013, the West End Community Plan included an opportunity to develop infill housing along the neighbourhood’s 33-foot-wide laneways and to enhance the laneways. This in turn enabled the City to recognize a number of individuals with strong connections to the West End by naming these soon to be residential laneways. The West End Journal will feature one of these newly name lanes, and the pioneer it honours, in each coming issue. On January 27 many West Enders paused to remember beloved West End resident, Vera Hollander, who passed in 2014 at the age of 93. Vera was an Auschwitz survivor and January 27 was both Holocaust Memorial Day and her birthday. Vera was born in 1926 in Bishtine, Czechoslovakia. On her eighteenth birthday, in 1944, German troops occupied Hungary and by spring, all the Jews in her village were deported to Mateszalka Ghetto. Soon after, Vera and her extended family were transported to Auschwitz. As the war was ending, Vera and her mother were forced out on a death march, but fortunately managed to escape. Vera carried her mother, who then weighed a mere 80 pounds, back to camp. There, on April 13, 1945, the Americans liberated them. Vera frequently spoke at local schools, including in her own West End neighbourhood, helping future generations never forget. 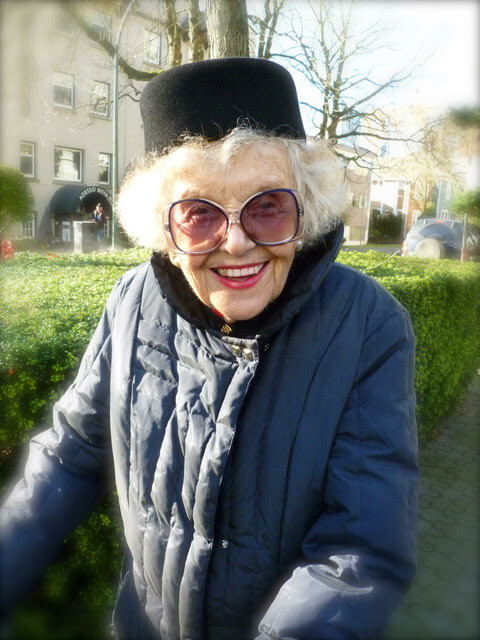 Vera and her husband moved to Vancouver in 1969. She was one of the founding members of the annual Vancouver Holocaust Education Symposium for western Canadian high school students. In recognition of her outstanding achievements in Holocaust education, the Governor General’s Caring Canadian Award was bestowed on Vera in 2002. For the story of her remarkable life see here, and to watch a video of her telling it in her own words, click here. Send your life milestone announcements to editor@thewestendjournal.ca and share both joys and sorrows with your community.